The Coastal Redwood is an evergreen and long lived tree reaching up to 1800 years or more in some parts of the World. This makes them part of a very group of the longest lived things on Earth. Some coastal Redwood trees grow to be over 115 metres in height and almost 8 metres in diameter. Once found in large numbers in California but commercial forestry reduced that number by 95% due to it's excellent properties for construction. Bark can be up to 30cm thick making it quite the challenge to get at the wood. The Coast Redwood is considered to have a conical shape with horizontal branches but sometimes they can be a little on the droopy side. The roots can be shallow and wide spreading so consider this when planting and the tree can be found mostly at 30 to 750 metres above sea level although some have been found as high as 900 metres. Tallest and long lived trees seem to be close to large bodies of water or access to regular water such as rivers, streams and fog. Few Redwoods are found close to the ocean due to salt spray. 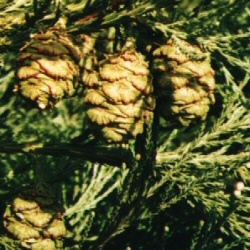 Typically, Wellingtonia may be planted as an individual tree or as an avenue of trees. Estate and Policy Woodland plantings from the 18th Century often found this tree planted along with other North American conifer species. Today, 150 years later these trees form an amazing sight and we think that this tree worthy of planting to achieve the same effect for future generations.